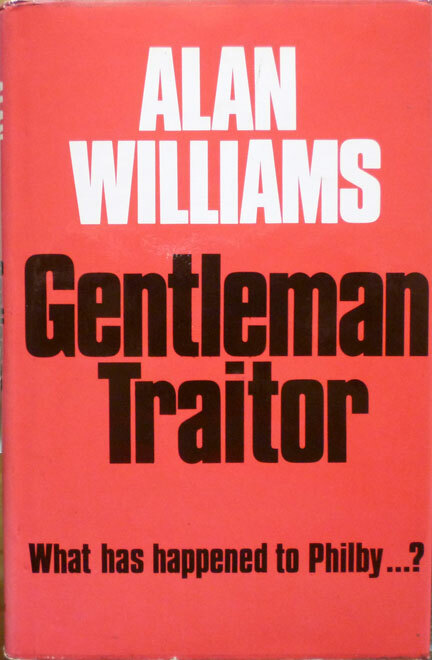 It's a UK hardback first edition of Gentleman Traitor by Alan Williams, published by Blond & Briggs in 1974, with a dustjacket designed by Ken Williamson. I bought it for £3.50 in the famed Fifteenth Century Bookshop (follow that link and scroll down to see the amusing comments about it) in Lewes, the East Sussex town etc., etc. It was lurking in the history section with some other spy-themed tomes, but it's actually a novel – or perhaps speculative fiction. The book takes as its premise the notion that Kim Philby, informal head of the Cambridge Spy Ring and subsequent defector to the USSR, wants to return to England... which of course he never did, eventually dying in Russia in 1988, but then Alan Williams wasn't to know that in 1974. It's an intriguing idea, nevertheless, and according to my perennially useful copy of Donald McCormick's Who's Who in Spy Fiction, it's also Williams' most "unusual and intriguing" novel – or at least it was by 1977, when Who's Who... was published; Williams wrote four novels after that. 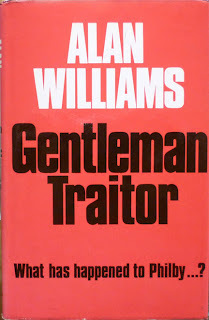 McCormick reports Williams as saying that Gentleman Traitor was based on an interview a friend of Williams conducted with a sozzled Philby in Moscow, who claimed he was "'fed up with Russia and wanted to leave'. In the novel," McCormick continues, "he did just this, and, bored, drunken and embittered in Moscow, agreed to accept a seedy job in Rhodesia for British Intelligence (still apparently riddled with old traitor chums of his always willing to lend a helping hand)... Philby... was vividly portrayed in this exciting and highly intelligent story." There's also a claim on the dustjacket back flap of Gentleman Traitor that Williams himself encountered Philby in Beirut the day before Philby disappeared to Russia. When I picked up this copy of Gentleman Traitor in the shop I vaguely recognised the author photo (by Bryan Heseltine) on the back cover. I have a feeling that might be from TV appearances Williams made years ago when I was a kid: he was (I assume he's retired now, although he's still alive as far as I know) a journalist as well as a novelist, writing for the Daily Express and covering the wars in Algeria and Vietnam, the Six Day War, the revolt in Czechoslovakia and the conflict in Northern Ireland. According to McCormick, when Williams was in Algeria, "both the Algerian and the French forces complained about him and suspected he was a spy!" Some of his earlier exploits are even more remarkable, though: when Williams was a student at Cambridge, he helped smuggle a Polish refugee out of Warsaw; he was involved in the 1956 Hungarian Revolution and masqueraded his way into East Germany; and he worked for anti-Communist radio station Radio Free Europe, which had links with US counter-intelligence. 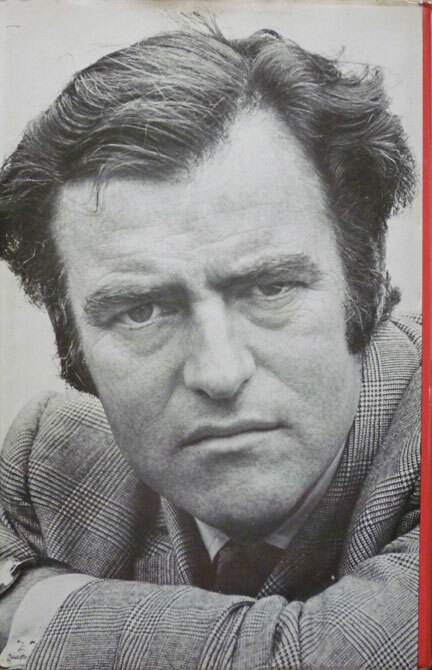 Son of actor and playwright Emlyn Williams, Alan wrote eleven novels in total, one of which, 1965's Snake Water, was turned into a 1968 James Garner-starring movie, The Pink Jungle. Writes McCormick of Williams' fiction: "One of the most important lessons of Alan Williams' ultra-realistic spy novels is that they are not just mere entertainment, nor are they, like some of this genre, mischievous realism. Each book takes a slice of history and builds around it with real and fictional people a credible story that really could have happened. Yes, even the Philby story... well, not in 1977, perhaps, but ten years ago such an incident would not have been as inconceivable as it sounds." If you're interested, there's a bit more info on Williams and a few links over at the Mystery File blog. First things first. I'm pretty sure Alan is still with us since I've yet to read my Guardian obit of him. But I believe he had a stroke a few years ago, so I guess he's probably rather frail. When last I heard he had a tiny flat in Holland Park, which he shared with a cat called The General, and was often to be found at the Chelsea Arts Club. Sadly, his third wife, the literary agent Maggie Noach, from whom he was amicably separated, predeceased him. I got to know Alan in the 70's when I was starting out as a literary hack. As long as you didn't mind occasional histrionics he was good company, with a fund of very plausible stories about espionage and realpolitik. Tho' he wasn't queer (like most of Blond's authors), he was certainly rather outre. Michael Frayn's Fleet Street novel, Towards the End of the Morning, describes how a smart-arse graduate trainee scandalises a bunch of hacks by asking for a Pernod on his first visit to the paper's local. Alan inspired this. "I never really lived that pastis down,' he used to say. Alan had a very fertile imagination but found putting it on paper a dreadful bind. To try and finish Barbouze he took a tramp steamer round the Med, and when it docked at Beirut he found himself next toi Philby at the bar of the St George's Hotel. Philby was dead drunk, but at one point woke up and invited Williams to join him for lunch at an excellent place where they did ' Abyssinian goat.' Alas, Alan had a prior engagement. Three days later Philby defected. Quite by chance, when passing through Tehran in 1969, I bought a proof copy of My Secret Life. I gave it to Alan, who wondered if it might have belonged to Philby himself. The notion that Philby might redefect was inspired by Alan's chum Murray Sayle's brilliant coup in buttonholing Philby when he went to pick up his copy of the Times. Alan was also very pally with people like Goronwy Rees, who'd been mixed up with Burgess and Maclean. In my copy of Gentleman Traitor he wrote: Don't be seen with this by Sir Anthony Blunt. The date was 1975, four years before Blunt was outed. I was also intrigued by your comments about Kingsley Amis, whom I interviewed for The Paris Review. But that needs a separate piece. Glad to have been of service. One thing I forgot to mention about Alan is that at about the time he went on the wagon for good (having been a heroic drinker), he also stopped writing. The link between drink and ink was never established. Still, I like to think that Alan's was a thirsty muse. As you may have guessed I'm not very familiar with blogging. Do you have an email address? And yes, he is very much alive and being his usual grumbly cigar-smoking self. If you'd like to contact me about him come to my blog milkitt.blogspot.com. Thanks for the update on your dad, Sophie. Since I wrote this post I've become acquainted with Mike Ripley, whose Top Notch Thrillers imprint reissued a couple of Alan's novels (Snake Water and The Tale of the Lazy Dog), so I'm a bit more familiar with Alan's work now (and I have a copy of the Frayn novel Michael Barber mentions above as well now, which I'll be blogging about at some point). Lovely blog, by the way. I've added it to my Other Fine Blogs list. Williams is my personal favourite of the great Williams-Lyall-Hall triumvirate that bestrode thriller writing for a brief and glorious era. I've just read his excellent 'Holy of Holies', which was blooming superb. Any recommendations for contemporary writers getting close to the heights these chaps reached would be welcome. On a sadder note Tome Books of Eastbourne, source of many a good thriller, have gone bust and are on the verge of closing. Their opening coincided with my discovering writers like Lyall and Williams, and I picked up a few good editions there (maybe the price they were selling books for proved their undoing). Oh well. Oh that's a shame about Tome. I did wonder about their 'all secondhand hardbacks for £2' business model – I'd peep through the cracks of the back wall at the other room full of stock and wonder what they had there that they weren't willing to put out for two quid. Guess I'll never know now! Yes, similarly. They did sell a bit of stuff on ebay, and maybe that's what they had there. Oh well, Camilla's survives and indeed will probably outlive us all.